Happy Friday! 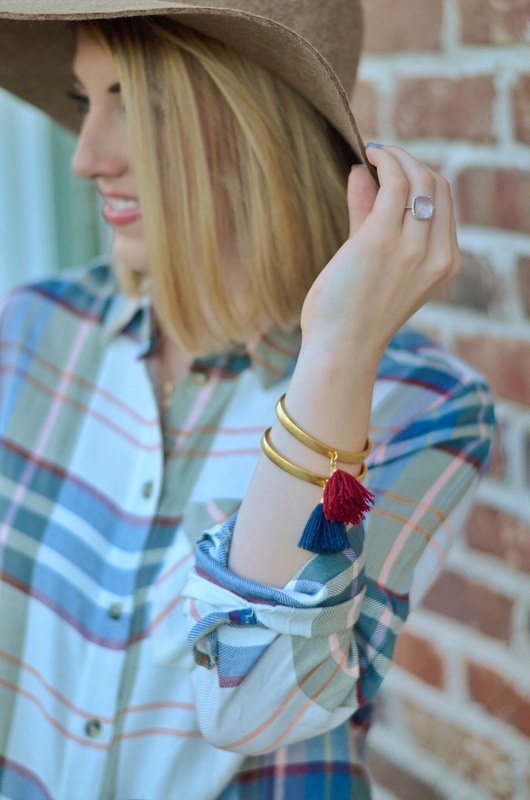 I am so excited to finally have Miss Madeline in one of my posts. She is so active these days that it is next to impossible to get a picture of her. I've found that the way to do it is to snap pictures of her while she's playing and exploring. She became fascinated with the acorns laying on the sidewalk, so while she examined them, Mama and I were able to snap a few photos of her. I can't get over how much she is taking in and how much she is learning these days! She will do things, and I am instantly like, "how on earth does she know that!" She certainly keeps me on my feet, but goodness do I love her! She is trying to say so many words right now, and it is just the cutest thing. Her favorite word to say of all is "apple." She even thinks that pumpkins are apples haha 🙈 I just love this age. As for my outfit details, I am completely obsessed with open front cardigans. I wear them all the time and with everything. When I wake up in the morning, I like to put one on over my pajamas when it's chilly in the house. I love to put them over dresses to carry my dresses into the fall. And I especially love the effortless look they create when paired with a tee and denim, like I'm wearing here. This one is only $79 and also comes in black. It's amazing! I recommend grabbing up a few fall colored tees (this one I'm wearing here is currently on sale for $20, and I recently grabbed up this one in olive), and a few open front cardigan to create several mix and match looks for fall. They will go so far! Happy Wednesday, Friends! Can y'all believe this pretty little dress is only $20?! I certainly can't. I never think to wear florals in the fall, but I would consider this to be the perfect fall floral print. How gorgeous would this be to wear to a fall bridal shower? The grey, blue and brown tones just scream fall to me. I love the way it looks paired with booties as this combination seems to be my go-to these days while the temps are still warm. But it also looks so pretty paired with heels or a dressy pair of flats. Happy Friday, Friends! Even though fall just officially arrived yesterday and it may still be in the 80s outside, I'm officially in fall mode. I won't be going overboard with a heavy jacket or blanket scarves just yet, but I am ready to start dressing in my lighter fall pieces. This lightweight dress is absolutely amazing and is such a cute fit. It comes in four colors and is under $60. Another thing I love about it is how easily it washes. I feel like every time I wear something out to dinner, it always gets dirty from handling my one-year-old. It is one of those pieces that I know I can wear and wash without even having to iron it. 🙌🏻 It has easily become my "mom dress" haha. Also, I love a subtle pop of leopard. 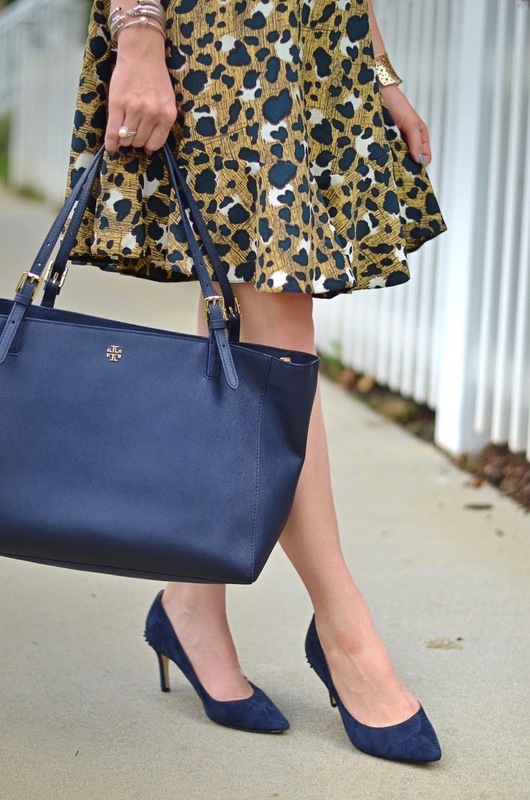 Tying it in with a scarf, shoes or a handbag, a touch of leopard can be so fun!!! This scarf isn't online yet, but I found a very similar one for under $30. And lastly, don't forget about the Tory Burch Fall Event going on through Monday where you can save 30% off purchases of $250+! My boots and handbag are both 30% off with the code "FALL16". 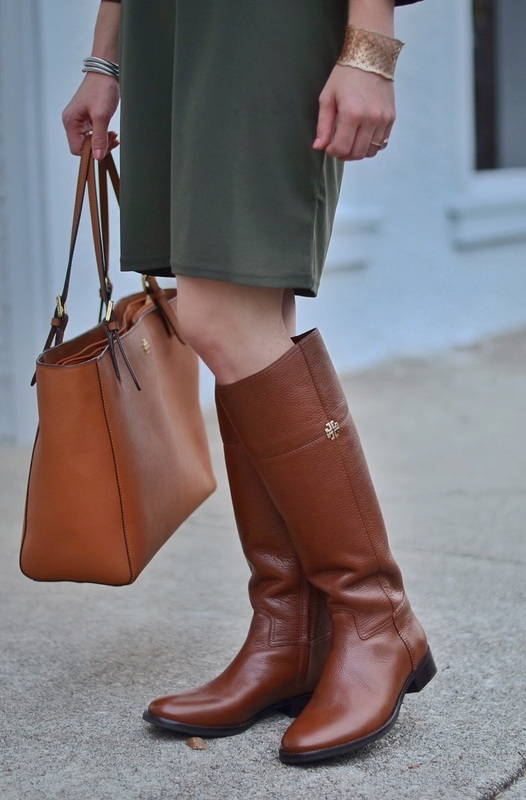 I love the Jolie Riding Boots because they are a pebbled leather and the perfect color brown! And the York Buckle Tote (which never goes on sale) has been an favorite of mine for years. I started out using the small size, and moved up to the large size once I had Madeline and started carrying more. It seriously holds so much!!! 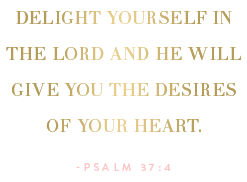 Tory Burch Fall Event ~ 30% Off!!! 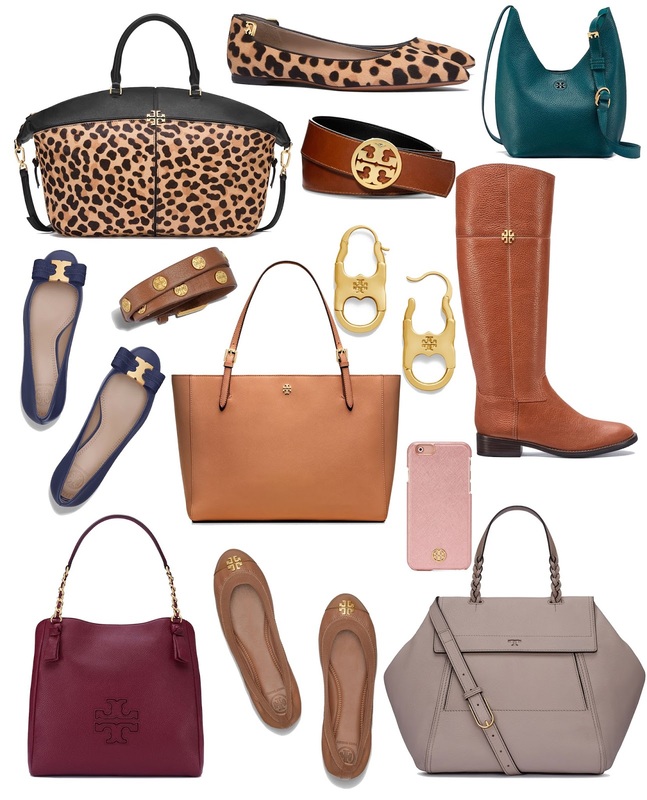 The Tory Burch Fall Event is here!!!! NOW is the time to grab up your riding boots, totes, or whatever you've had your eye on. This is most likely the last opportunity to purchase a pair of Tory Burch riding boots at a sale price for this fall. What's great about the sale this time around is that the promotion is 30% off all orders of $250 or more, whereas in the past, you would only save 20% of the lower cost orders and the more you spent, the more you saved (I believe it was over $700 to save 30% in the past). But this year it's 30% off any order of $250 or more! There are only a few exclusions, such as the Reva Flats and the Miller Sandals. But the York Buckle Tote (my favorite tote of all time...I have it in three colors) is included in the sale. It is the most versatile and durable bag! This sale takes almost $90 off of this bag. I think the Jolie riding boots are my favorite! The sale takes almost $150 off of them. I am also in love with this purse. I have been wanting a grey handbag. What I love about this one is that the hardware is gold, whereas it is usually silver on a grey purse. I'm most definitely a gold girl, so this is the perfect grey bag. 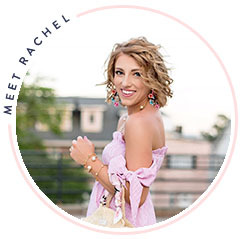 See more of my favorite picks below! There are SO many great things! Just enter the code FALL16 at checkout to save 30% off your order. You can shop more of the sale here. What's your favorite item in the sale? It is still too hot to actually wear this jacket all day, so I wore this easy, comfy dress without the jacket the day we did these photos (see it here on my Instagram). I absolutely love it! It is the softest thing. Also, it comes in a handful of colors and is only $44. 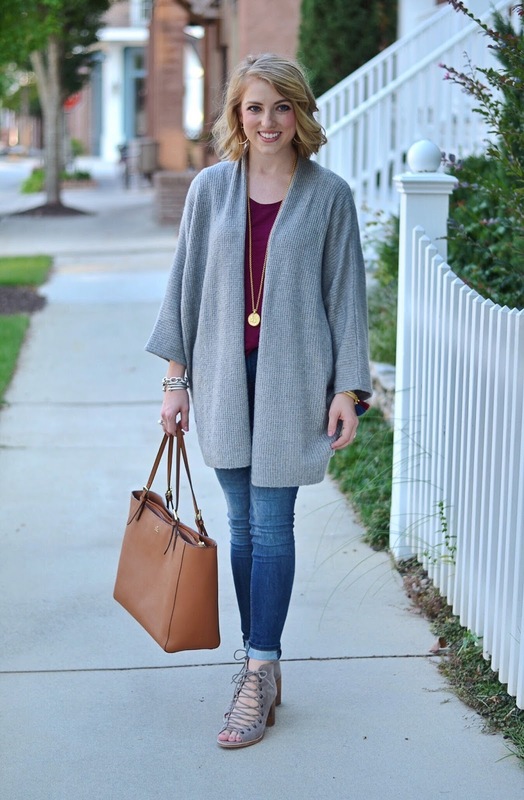 I may have to grab up another color because it is so perfect for layering and pairing all fall long. Do you have a field jacket? If so, what is your favorite way to style it?